HomeBiz-Tips Ezine: March 15, 2006 Issue with 3 gifts! Are you one of those guys addicted to Internet marketing forums wasting your valuable time? Do you find it difficult to get out of these forums and concentrate on working on your business? Your attention gets diverted which results in diminished concentration and focus. Lower productivity. If you spend most of your time on forums rather than getting to work what else can you expect! Perennially procrastinating. If you do not want to solve a problem or learn that software or read the eBook you bought, you just hit the forum! Heightened sense of pessimism, apathy or jealousy. You may experience all of these during the time you spend in forum during your work hours . Endless/senseless debates and idle gossip. You may find yourself getting sucked into this kind of non-productive exercises. Slow reduction of your own intelligence and progressively substituting it with the tribal group think attitude of the forum. It's dangerous! Income may suffer. Instead of getting to work, you will find reasons unconsciously to return to the forum just to avoid the work. My experience is that participating in any one forum on an ongoing/daily basis for a few months will lead to unproductiveness in most cases. The earlier benefits of knowledge acquisition, promoting your business and making new contacts will begin to derive diminishing returns on the long run. So establish clearly marked boundaries while participating in forums. If not, you are at risk of falling into an unconscious pattern of addiction and become sitting duck for these forum owners and their cronies. "Did you know that "The Information Publishers Rules" are 100% necessary for most but you are an exception! It's totally unnecessary for YOU! 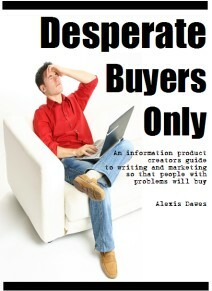 Alexis Dawes is a successful eBook writer who sells her eBooks quietly but efficiently. The proof she provides is hard to believe but every inch true. She does not participate in a lot of discussion forums to make herself more visible among peers and prospects. She does not spend hundreds or thousands of dollars a month advertising on Google Adwords. She does not send out articles every week to promote her sites. She does not seek out affiliates, joint ventures, or testimonials. She does not pile on 50 different bonus items to my offerings. That means she is not doing most of the Internet marketing activities that one is supposed do! Then how does she make this kind of huge money as the proof says? That's what 'Desperate Buyers Only' all about. She reveals how to create info products and eBooks for a particular desperate category that sells. This could be the *missing element* to your online success and it goes completely against what the "gurus" are pitching you. AdSense allows website publishers to display contextually relevant Ads on their website. If a web visitor "clicks" on Ads, the web publisher will earn a percentage of the Ad revenue generated as a result of the click. Many webmasters have built content websites around Google AdSense. In many cases the specific intent of the webmaster is to profit from Google AdSense. Other webmasters use Google AdSense to supplement their revenue. The following tips will help webmasters looking to profit from AdSense. 1. Niche Sites: Targeted niche sites that have a clear theme, tend to generate more advertising revenue simply because it is easier to achieve decent search engine placement. Be warned though, you want to chose a niche where there is a sufficient number of Ads available. 2. Target Keywords: When determining the sites focus, consider how much the advertisers pay for the Ads. If the site is focused on ringtones, like Ringtone Central the payout per click is going to be very small, as ringtones are not high ticket items, advertisers will not spend a lot on pay per click Ads. 3. Aged Sites / Time: Over time as a website is spidered by Google, Ads will generally increase in relevance. In general, older websites will rank better in search engines. The closer the Ads relate to the webpage's content; the higher the "click-through" the publishers will see. 4. Coding: In order to minimize a websites maintenance place the Google generated AdSense code in the website template or an include file. This will allow you to easily experiment with different Ads sizes and ad placement, and keep the web maintenance to a minimum. 5. Tracking Channels: In order to know how effective a specific website or ad placement is use distinct channels and subchannels within Google. This will allow you to discern what performs best on a specific website. Using channels will tell you what sites are making money, what Ads are making money and what ad position is the most profitable on a specific website. Keep in mind that you should run an Ads for a full week, in order to properly test its effectiveness, different days of the week will vary the web traffic so comparing one week to another will give the most accurate reflection of how effective a campaign performs. When testing different Ads sizes, placement or color schemes be sure to leave campaigns in place for one week, different days will often result in web traffic fluctuations. Comparing web traffic, week to week will give a clear indication of what ad formats perform the best. 6. Integrated Ad Placement: Many webmasters have been successful at integrating Ads into a website. The easiest way to integrate an Ads into a website is to remove the Ads border. This will allow the ads to better blend with the webpage. Google recommends contrasting the link colors with the website colors to increase click-throughs. It is also suggested that webmasters randomize the color of the Ads, so that frequent users will not naturally "filter" the ads. 7. Number vs Value of Ads: Up to three Ads can be listed on each page. This decreases the value of the Ads served, so publishers should cautiously add Ads units, as it dilutes ad inventory. In other words you want to serve the most expensive ads at all times. 8. Hot Spots: Like web copy above the fold holds true with AdSense as well. This means that Ads that appear without having to scroll will be read more frequently. Hot Spots are areas on a web page that result in a higher percentage of click-throughs. According to Google the highest paying Ads are located on the hot spots. Google does not indicate if image Ads or text ads perform better, so webmasters are encouraged to experiment with both. design and layout, publishers may experience different results with different ad sizes, placements and color schemes. Experiment and track the results for each website to maximize the AdSense payout. 1. PopUp Bonanza -: It's a proven fact that popups improves your subscription ratio and conversion ratio. Some estimates a hike of more than 500 percent. But what do you do with popup blockers around. 2. Article Submitter: Writing short articles with your bio is one of the best ways to market your website. This is proved time and again as Internet is primarily an information medium and the public is hungry for quality content. But there are two problems. 1. FeedBlitz - : RSS, Blogs, XML, readers and aggregators can be confusing. But adding email services to your blog isn't. Email RSS feed and blog subscriptions powered by FeedBlitz. It's easy too! No gurus required. The basic service is free to all - no restrictions, no ads, no limits on your subscriber base. Plus, you can subscribe to any blog or RSS feed by email with FeedBlitz, even if that blog does not use FeedBlitz itself. 2. Easy Cleaner -: EasyCleaner is a small program which searches the Windows registry for entries that are pointing nowhere. EasyCleaner also lets you delete all kinds of unnecessary files such as temps and backups. You can search for duplicate files and you can view some interesting info about your disk space usage! You are also able to manage startup programs, invalid shortcuts and add/remove software list. ToniArts may not be held accountable in any way if EasyCleaner affects your computer in a negative way. Well. That sums up the first fortnight of Mar-2006. Do not Forget To Rate 'HomeBiz-Tips'. Your valuable vote helps us to improve this E-Mag as well as allow us to keep it Ad-Free.